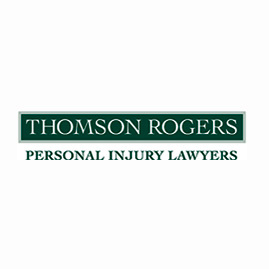 Thomson, Rogers is one of the largest personal injury law firms' in Canada. They specialize in representing people who have been injured from all types of accidents. They have a well-deserved reputation for taking on the most complex and challenging personal injury cases and achieving maximum results. They have extensive trial experience including representing clients at the Supreme Court of Canada. They have lawyers who have been named by their peers (other qualified lawyers) as experts in their field and have been designated in Lexpert, and in Best Lawyers - Canada. Six former Thomson, Rogers partners have gone on to become Judges in Ontario. They have lawyers who have been Benchers (Law Society of Upper Canada), Presidents of the Advocates’ Society, and the Ontario Trial Lawyers Association. The lawyers and staff are also actively involved in the community, including the Spinal Cord Injury Ontario, Ontario Brain Injury Association, the Disabled Sailing Association of Ontario, and Mothers Against Drunk Driving (Madd).